Cool idea Kari. Now I just have to get a plow plane! You could try to jam something into the first groove as you're plowing the second. That might help the "snap" factor. You might want to let Lee Valley know... Plow plane AND peg maker. Cool idea. Clever girl! I'll steer my wife to you to explain why I had to buy a plow plane! Hope you and Nancy have a great holiday! Oh yes, is it ever time for a plow plane, thanks for the great tip Kari! Brian, I thought about that, too. In fact, if you needed to make a bunch of pegs on a regular basis and at regular sizes, you could make a brass spacer that you could also use to set up your plow plane. I'm definitely going to use this with future projects. 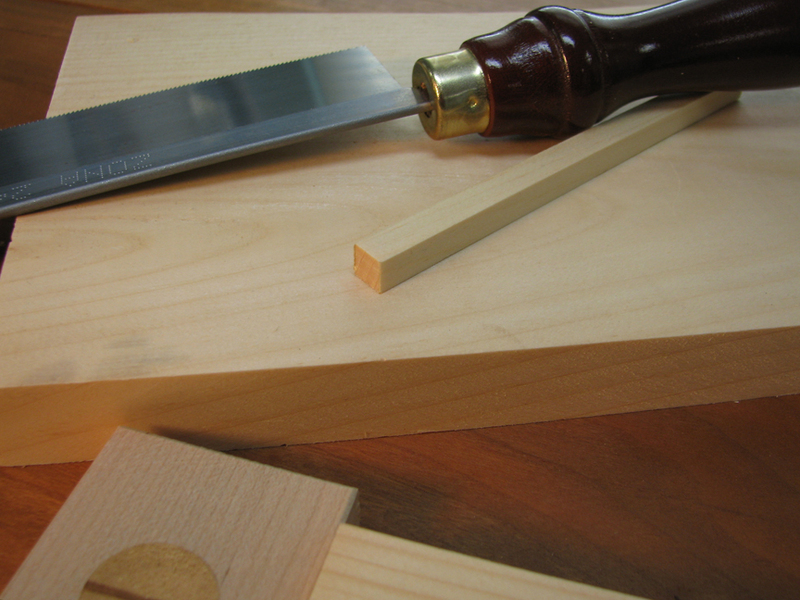 you could use the plow plane to make wooden spacers . I have used my router plane and 1/8th inch blade for this. I've outdone my allowance for tools this week! Can"t you do the same thing with a slitting gage? This is another example why I follow this blog like a hound dog follows a hot scent ! Yours is by far one of my favorite sites Kari. Mark, this plow plane has come in handy on more than one occasion. I just ordered the 3/4" blade and conversion piece so it will work as a rabbeting plane. 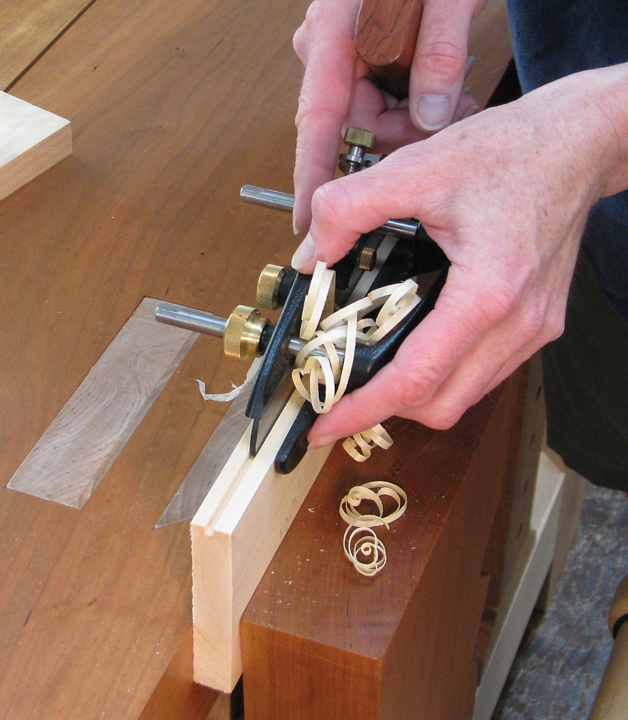 Thank you for posting your idea about using a router plane. Ron, there's an idea. I've never used a slitting gauge (nor seen one in the wild) but it's certainly worth a try if you have one. Let me know if you try it and if it works. I just get somewhat tickled when I see Lee Valley being mentioned anywhere outside of Canada. Silly of me, I know. I was even slightly amazed to see some of their "Veritas" line in Las Vegas way back in 1991. Others gamble. I shop for tools. Probably just as expensive a pursuit though. Now here's the real trick. Use your plow to create the groove, say 1/4. Then make the 1/4 square in another species. 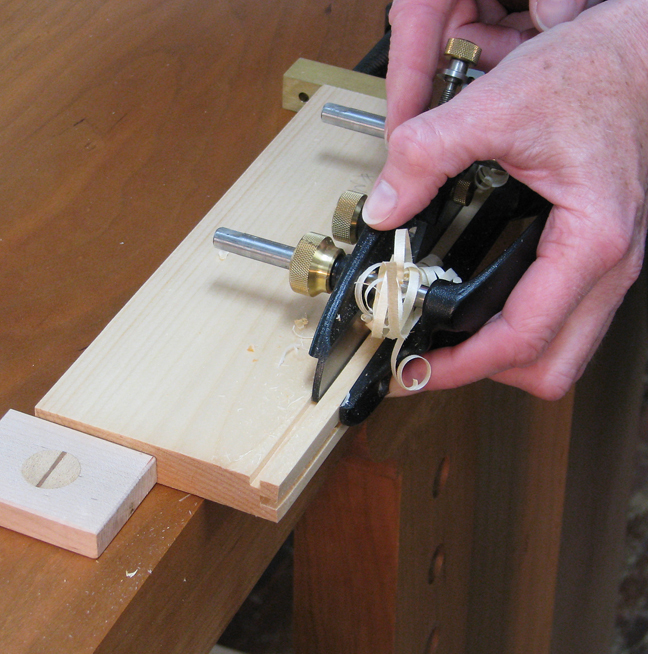 Now you have a perfectly sized inlay for things like picture frames or table edges. If you're really wacky you could repeat the proces with a 1/8 and get an inlay in an inlay. I have used this technique myself, not to make square dowels, but just as a labour saving method to produce large rebates. I suppose the square peg that is left is a bonus that hadn't occured to me!!! Love the blog. Thank you for taking the time to write it. Daniel, thanks for letting me know. Ha - wish I'd seen this an hour ago = making a box with my 11 year old and had fun much planing down stock to 3/8 square to fill a thru dado we plowed... Great tip.